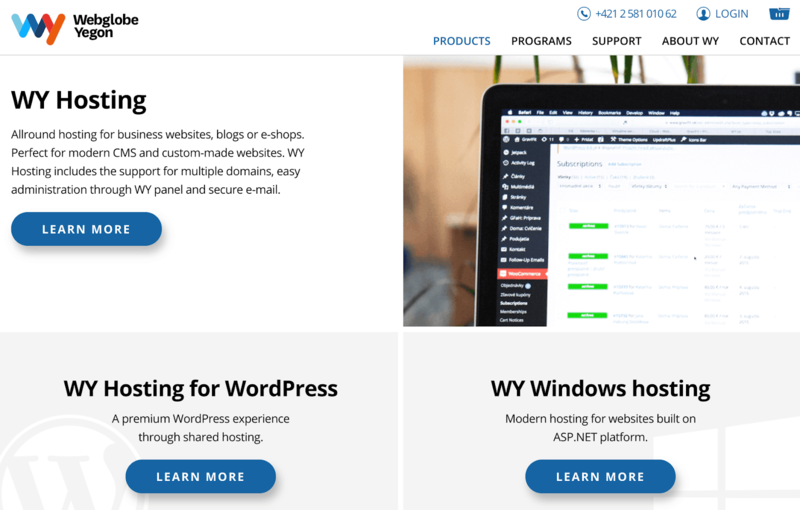 Webglobe Yegon Review 2019: Is Webglobe Yegon a Good Hosting? Webglobe Yegon has been trading as this brand since the merging of its two forerunner companies in 2014. This company hosts corporate websites, blogs, e-shops, large portals, and even modest presentations for individuals and businesses within Slovakia and around the world. Webglobe Yegon is a Slovakian web hosting company known for providing web hosting solutions, e-mail services, domain name registration, and other internet services. The current company was formed by the merger in 2014 of its two forerunner companies – Webglobe and Yegon – and has been operating under the new name since 2015. In addition to its native Slovakia, this business has a notable customer base stretching to the Czech Republic, Brazil, Poland, and the United Kingdom. The Webglobe Yegon website can be switched between Slovak and English languages. redundantly interconnected by their own optical lines and are built on three fundamental values: accessibility, speed, and security. This vendor uses HyperV (classic virtualization) and VMware (cloud virtualization) technologies to ensure optimal availability and scalability. What’s more, their non-deployed virtual servers – which run on cloud infrastructure – provide even more reliable performance. Webglobe Yegon hosting solutions use both Linux and Windows operating systems. Their premium cloud solution is best suited to large e-commerce websites, magazines, and online portals. This provider has a new Webglobe Yegon (WY) control panel that has been simplified to make it easier to manage small e-commerce websites and to set up and manage your own email. Webglobe Yegon’s prices are in line with other Slovakian web hosting vendors, and you get a lot of features for your money. They have flexible payment plans including monthly, annual and biennial options, and you get a discount for committing to 12 months or more. Their 14-day free trial and 30-day money-back guarantee may make it easier for you to make the bigger commitment, as might their 99.98% uptime guarantee. Webglobe Yegon customers can contact the helpdesk via live chat, email, social media messaging, or telephone, but not tickets. While they purport to offer round-the-clock support, their technical support team is only available on weekdays from 8.00am to 7.00pm CET and at weekends from 9.00am to 2.00pm CET. My own assessment is that the support team has short response times and can effectively solve hosting issues. In addition, the Webglobe Yegon website has a fairly detailed knowledgebase with a large number of articles, blogs, and tutorials. Webglobe Yegon provides reliable web hosting solutions with an array of features for personal blogs, e-commerce websites, and even busier websites with thousands of visitors. That said, the fact that their technical support team is apparently not available 24/7 could be off-putting for more sophisticated website owners who want genuine round-the-clock technical support. Check out Webglobe Yegon’s web hosting options today! Wondering how Webglobe Yegon stacks up against other Web Hosting companies? Enter any other Web Hosting company and we will give you a side-by-side comparison.